Brogan-Moore: Touching isn’t it? The way he counts on his wife. Sir Wilfrid: Yes, like a drowning man clutching at a razor blade. 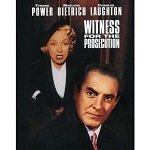 –Harry Kurnitz, born this date in 1909, in his screenplay Witness for the Prosecution. Writing prompt: Write a scene in which your protagonist must reject the assistance of someone your protag should be able to count on.